It’s been Golts overkill. Despite the risk of overdosing, he has an article in Ogonek from 25 September which merits attention. One could do much, much worse than to pick him, if you could read only one commentator. Golts tries to explain why Russia’s OPK, its defense sector, has failed. He gives prominent examples of defense industrial shortcomings including the most recent Bulava and Proton-M failures. Interestingly, he says all serially produced Bulava SLBMs are being returned to Votkinsk for inspection. You may recall reading Piskunov here at the start of April. Putin said work should be organized so producers’ capabilities coincide with the allocated funding. Money, he said, shouldn’t be hung up in accounts [and stolen] while we wait for ships. Golts reads this as Putin recognizing that the state of domestic industry is such that it can’t assimilate the gigantic sums allocated to it. The defense sector has structural problems that endless calls for mobilization to face an aggressive West can’t resolve (i.e. a workforce that’s almost reached retirement age, continued aging of basic production equipment). But Golts focuses on poor coordination and cooperation among enterprises, government customers, and sub-contractors. 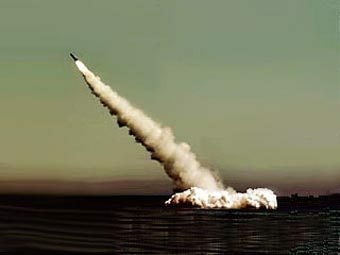 He turns to the familiar case of Bulava — 650 different enterprises reportedly have a hand in turning out this missile. Most damning, Golts compares today’s “so-called united state corporations” unfavorably to Soviet-era defense industry ministries. Ineffective and bureaucratized, the latter still managed to manufacture massive numbers of weapons. And Gosplan matched prices for products and production by fiat. Today’s goskorporatsii can’t. There’s another important difference, Golts points out. All Soviet “civilian” industries also produced arms, or parts for them. Average citizens buying civilian goods helped finance military production with their purchases. But the largest part of this permanently mobilized industrial system died in the 1990s and surviving parts retooled for other production. Many in the latter category no longer wanted part of the defense order which would only make them less competitive in their main business. Today’s OPK chiefs don’t have the talents of some of Stalin’s industrial commissars, says Golts. They are, however, good at blaming ex-Defense Minister Serdyukov for “destroying” the voyenpred system. Golts recommends a policy of targeted and specialized re-industrialization. Because of the expense, he says build specialized component factories to support production of critical systems where Russia is decades behind developed states — communications, reconnaissance, UAVs, precision weapons. Russia will have to prioritize and Golts doesn’t see tanks, ships, and heavy ICBMs as priorities. Those who pick the priorities have to withstand attacks from lobbyists for these weapons. Golts believes Deputy Prime Minister and OPK tsar Dmitriy Rogozin knows the bind he’s in . . . and that’s why he says put off the beginning of serial production of many armaments until the next armaments program (2016-2025). This post is admittedly as much about using a good photo and video as relaying something you haven’t heard. But the visuals bring the subject to life a little. At any rate, the lengthy Russian holiday season is upon us, so any post (even one with fluff) is better than none. 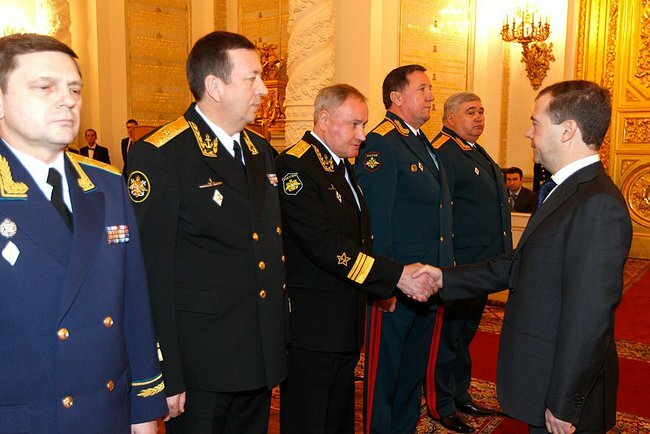 Tuesday Russia’s lame duck President and Supreme CINC Dmitriy Medvedev greeted a group of military men — Armed Forces, MVD, FSB, SVR, and MChS officers — in the Grand Kremlin Palace’s St. George’s Hall to congratulate them on their new command positions or promotions to higher ranks. Shown above are (from right) Southern MD Commander Aleksandr Galkin, Central MD Commander Vladimir Chirkin, Northern Fleet Commander Vladimir Korolev, Black Sea Fleet Commander Aleksandr Fedotenkov, and VVKO Commander Oleg Ostapenko. Galkin and Chirkin are apparently there to mark their elevation to three-star general-colonel rank, while the latter three are now at new posts. And Ostapenko’s sporting a blue uniform. Didn’t the ex-Space Troops wear green reflecting their RVSN roots? Pervyy kanal covered the ceremony, showing Medvedev, three VVKO and/or Air Forces general-majors, a Bulava launch, and assorted siloviki, including Sergey Ivanov, Nikolay Patrushev, Rashid Nurgaliyev, and Aleksandr Bortnikov. The first general-major wearing the blue uniform is Sergey Popov, late chief of air defense for VVS, now Commander of VVKO’s Air and Missile Defense Command. The second couldn’t be identified by your author. The third is Igor Makushev, Commander, 1st Air Forces and Air Defense Command (perhaps just the 1st Air Forces Command since the advent of VVKO). But returning to Medvedev and Bulava . . . the Supreme CINC’s words unleashed minor euphoria about the SLBM’s imminent acceptance. For example, on December 28, RIA Novosti reported its highly-placed Defense Ministry source claimed a decision on accepting the Bulava-Borey weapons system is before the country’s political leadership. But Medvedev didn’t say the missile is now ready to be accepted. He just said it would be, and we already knew that. Also, he never mentioned Borey-class SSBN Yuriy Dolgorukiy which must be accepted in tandem with Bulava for this strategic weapons system to achieve IOC. Vedomosti’s Defense Ministry source was more on the mark saying Bulava “practice” launches could continue for some time. Going slow would seem to track with Defense Minister Serdyukov’s apparently unhurried approach toward Bulava at this point. There have been reports that Dolgorukiy isn’t ready, and launches next spring and summer could come from Borey unit 2 Aleksandr Nevskiy by then. At any rate, the Bulava program’s come a long way from the nadir of its December 2009 failure. But this isn’t exactly the end of the road either. Moscow still has to work out a reliable and well-controlled production run of some 128 missiles (and 768 warheads) plus spares. Not to mention ramping up construction and completion of eight Borey-class boats. Thank you for reading this meandering post, as well as others this year. Your author wishes you a happy 2012. Interfaks reports an expected salvo launch of two Bulava SLBMs has been put off until next year, as Defense Minister Serdyukov said it might. The press agency cites a well-placed Navy Main Staff source. RIA Novosti, however, citing its own Navy Main Staff source, says the test was delayed by weather, but will occur today or tomorrow. For its part, ITAR-TASS cites an OPK source who says the Bulava test firings are off until June because of White Sea ice. The last Bulava test, a success, took place on October 28. The Bulava / Yuriy Dolgorukiy weapons system might have been accepted into the inventory before year’s end following a successful salvo launch of two missiles. BFM.ru talked recently to Aleksandr Golts and Vladimir Yevseyev about Bulava. It notes the last planned launch of 2010 was also put off for ice. Golts believes there’s a political motive for postponement. He thinks the Defense Ministry can’t allow another failure and blow to its reputation and the image of Russian weapons. And, by the time of the next test, the elections will be over, and Serdyukov may no longer be at the Defense Ministry. Golts attributes Bulava’s problems to problems in the component base and the collapse of the Soviet sub-contractor chain. The lack of serial production has made it impossible to guarantee quality component manufacturing. Hence, something different seemed to go wrong in every test failure. Golts doesn’t rule out the possibility that there simply aren’t enough missiles for testing (or for picking ones to test) because of the GOZ-2011 contracting dispute between the Defense Ministry and Bulava’s producer. Yevseyev is a suspicious about postponing a shot for weather. He calls the situation around Bulava ambiguous and unclear. He says defects in the missiles might have been identified, and poor weather could be an excuse. It seems understandable risk tolerance would be pretty low at this point given the history of the Bulava program, the bad publicity and angst generated by recent high-profile space failures, and the political season. Perhaps it’s a case of better late, but better. This week Izvestiya reported on coming launches of the Bulava SLBM. The paper’s sources say the military and industry want two single test firings before trying a salvo launch test. They suggest Bulava’s early problems were due to testbed Dmitriy Donskoy. They also report complaints about the new Borey-class SSBN Yuriy Dolgorukiy. A Navy staff source tells Izvestiya two single Bulava launches are planned before a salvo launch of three [not two as previously reported] missiles is attempted. An industry source confirms this plan, and adds that Bulava testing is on schedule. The industry source says Bulavas produced more than two years ago – before the military leadership ordered production inspections – will be used in the test launches. A specialist tells Izvestiya mod Typhoon-class SSBN Dmitriy Donskoy is now viewed more often as the problem in Bulava’s early failures than the missile itself. The launch window for Yuriy Dolgorukiy is October 20-22. According to Izvestiya’s interlocutor, the success of all Dolgorukiy launches supports suspicions that Donskoy might be to blame. This seems somewhat flawed logically if the Bulavas themselves were assembled and inspected differently . . . unless they never found any real problem with the missiles. If the October launch is successful, Izvestiya reports the next will be November 18-19 and the salvo launch of three missiles will be in December. Success in the latter would finally confirm that the Bulava is ready for combat duty, and the Bulava / Borey weapons system could be accepted. But Izvestiya also reports the Borey’s radioelectronic, hydraulic, and hydroacoustic [sonar] systems still don’t satisfy the Defense Ministry. The command and control systems aren’t properly configured yet either. In short, the SSBN hasn’t fully completed its development. And it’s certain the lack of an agreed purchase price and a contract isn’t helping this process.